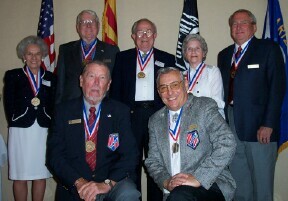 At the luncheon meeting on 16 November 2002, Chapter MSM’s were awarded to eleven members of the Arizona Chapter for sustained superior service to the Chapter and it’s members. Recipients were, Norman Derouin (deceased) – accepting for Norman was his widow Helen, Dan Conway, Raymond Deane, Chet Baumer, Ron Green, Velma Birtciel, and Bernie Conway. Due to health problems Ray Hitzel is not shown in the photo and his medal was presented at his home. Also not shown in the photo are Jack Bryan (deceased), Ron Drew, and Pete Magadan who will have their medals presented at the December meeting.